Welcome to my stop on the blog tour for The Three Thorns by Michael Gibney, hosted by Chapter by Chapter. 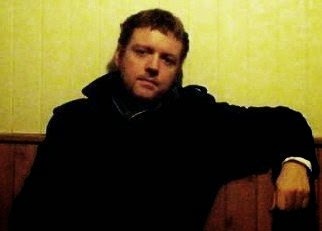 Michael Gibney was kind enough to answer some questions about his novel and writing experience-- thanks! Three brothers born to a powerful fallen King were abandoned at birth and cast out into the old world known as “Earth,” as orphans. By order of the false King, three of the new world’s most lethal assassins have been sent to kill the children before they come of age and plot to avenge their Father’s throne. No one knows where the children are, and they have no knowledge of one another. But that all changes when Benjamin, Tommy and Sebastian join together to face adversity, an unspeakable evil and the temptations of magical powers. 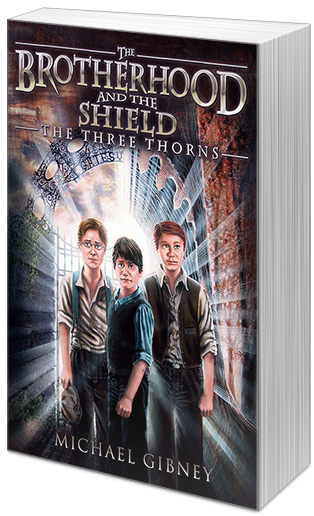 The Three Thorns is book one in an exciting children’s fantasy series called The Brotherhood and the Shield. Tell us about your main characters. Who are Benjamin, Tommy, and Sebastian? These three main characters that make up The Three Thorns, start out as average abandoned pre-World War English children. Two are brought into lower-working class backgrounds and government upbringings and one is brought into a wealthy family, which doesn’t make much difference as all are treated like garbage by their elders. Each character is different and conflicting personalities as they struggle to grow up under harsh oppression and the lack of love shown to each of them is the ultimate test of endurance of the good that is inside each boy. Benjamin is the most vulnerable and emotional of the three. He is shy, easily intimidated but very ambitious and resourceful. In ways he has the biggest heart of them all and it is in this trusting trait of his that leads him astray in the books to come. His naivety is his ultimate weakness. Tommy Joel is not very likeable. He’s a survivor at heart but abuses his selfish need to look after himself and turns his survival instincts into bullying with physical contact. He is boisterous, selfish and a troublemaker. His reactions to his circumstances show he is a very different nature than Benjamin. Tommy is filled with resentment and anger he may or may not learn to master as the books progress. Then there is Sebastian Cain. Born into wealth of the London theatre owners, the dreaded Cains, Sebastian lives the opposite of an Annie or Oliver Twist. Instead of wealth making his lifestyle happier, it brings him great burden and responsibility thrust upon him at an early age by his wicked guardians. Sebastian is the most independent out of the three boys and the most educated. He doesn’t suffer fools gladly and refuses to be intimidated by Tommy, unlike Benjamin, who tends to cowardly back down to Tommy. Sebastian is very brave and is the smartest of the three. In ways he is also the most posh and snooty, which he carries off with mannerisms that are nothing short of comical. Benjamin, Tommy and Sebastian discover they are brothers by blood and Princes to another world they must return together to save. They make up the central structure of the Brotherhood and the Shield series, as they are the Brotherhood. This novel is book one in The Brotherhood and the Shield series. How many books do you have planned for this series? When can we expect the next book? The Brotherhood and the Shield was supposed to be a simple trilogy but the broad scope of its characters and massive scale in plot twists and storylines wouldn’t allow that, so I had to expand it into a seven book series. I am currently on the 5th book in the series. What everyone can expect in book 2, ‘Legion of the Two Knights’ is more of everything that made The Three Thorns so great. Everything is in more detail in book 2. There is more action, more character and plot development and revelations and there are more thrills and rides as well as introductions to a whole cast of new and colorful characters that makes Legion of the Two Knights a solid stepping stone to the series. An accumulation of things inspired this series. My best friend’s loss of his parents, my childhood struggles and books in its genre that never quite managed to bring the realism of loss, tragedy and sacrifice. Lord Of The Rings, Eragon, His Dark Materials, Potter, and the Narnia series all have happy endings and no sense of true danger. I wanted to create a book series that didn’t feel as safe and with a story that was full of risk and consequence. What makes The Three Thorns different from other books in the genre? I'd say its heavy realism makes it unique. The Brotherhood and the Shield storyline is very dark and deals with more tragedy than the comparisons mentioned. It also incorporates science fiction, which I don't think has ever been attempted before in a Children's fantasy series such as this. I've always felt that the reader is the true critic, so that will be up to them to decide. However, I will say I never wrote The Three Thorns to be ‘as good as’ or to be better than anything. I wrote The Three Thorns to be its own thing. I wanted the story to be as individual as possible. That is my goal in my storytelling. I want to offer something that hasn't been offered to the public before; something new that pushes the boundary, if possible. Hence, my inclusion of self-made mythology and creatures within The Three Thorns and its successors. Do you have a favorite character? Were any harder to write than the others? A lot of the books deal with one particular character that I believe most readers will relate to. His initial character in The Three Thorns is that of a loveable heroic underdog but his character changes later in the story. Although I identify mostly with the character of Benjamin Brannon it is actually the main villain’s cold-hearted steel handed henchman, Jodo Kahln who is my favorite because he was such fun to write. I honestly found none of my characters hard to write as I find it natural to write from different perspectives and take into account different personalities of the characters. Background characters, like the policemen in the story for example I find hardest to write because there is no connection, backstory or depth to them. These background characters are rather two dimensional that I find hardest to write but realize that character fillers that set the mood and tone to a chapter like these are a necessary evil. If you could travel anywhere in the world, cost being no object, where would you go? Japan. I feel I relate most to the Japanese way of life and its beautiful culture. I also take great inspiration from its art and its anime industry. I believe the Japanese will embrace and love the Brotherhood and the Shield series. The Shire, Hobbiton from Lord Of The Rings (also known as, Wellington, New Zealand). If you could have dinner with any historical figures, who would you entertain? What would you serve? Shakespeare. I would serve a roast feast and red wine to keep him talking. I began writing scrap book short stories as a teen but properly, I began writing screenplays in my early 20s and my first novel, The Three Thorns I began writing when I was 24 as well as the sequels ever since. What is the best advice you’ve received about writing? The worst? Best advice was from my Grandfather. He told me to keep everything simple and short. Don’t over-complicate anything. The worst advice I was told was to give up, that I wasn’t a writer from a reviewer who was clearly bitter and jealous of my work I showed him. But, he was a banker and businessman trying to turn author and take a slice of an industry and pie he hasn’t paid his dues in. Granted, he isn’t an artist and hadn’t made the sacrifices I have made to get as far as I am, so I didn’t take anything he said seriously. It’s not like he was a literary expert or had served any time in the publishing business. He was a simple banker and a wannabe author with a large chip on his shoulder. To be told to give up by anyone is the worst advice I believe anyone can get. Do you have any advice for new writers just entering these shark infested waters? Yes. Don’t let anything or anyone make you doubt or trample your hopes. If people fail you, your work won’t and it’s the readers who decide your fate, no one else. I would urge them to grow thick skin, because knocks, set backs and rejections are inevitable and unavoidable. Keeping a good and positive attitude will see you through to the right group of professionals who will work with you and believe in your work and its potential. No. I believe in this day in age technology has robbed us of any mystery. We now know what Stephen King has for breakfast just by going onto his twitter feed or we demand what the next book in a series we love is all about. I’m old school in the sense that keeping the fine balance of exposure and mystery only creates a bigger want and buzz about a book/author.